About one and a half years back a dear friend of mine sent me a message saying that she found a restaurant that she thinks I will love. A few months after that we planned to visit this place together and I did fall in love. I passionately love Mediterranean cuisine. I have tried out many restaurants. I have liked some but have been disappointed by a lot of them. There are only a few that have made indelible marks and have made me go back for more. There are even fewer that compelled me to do a review. 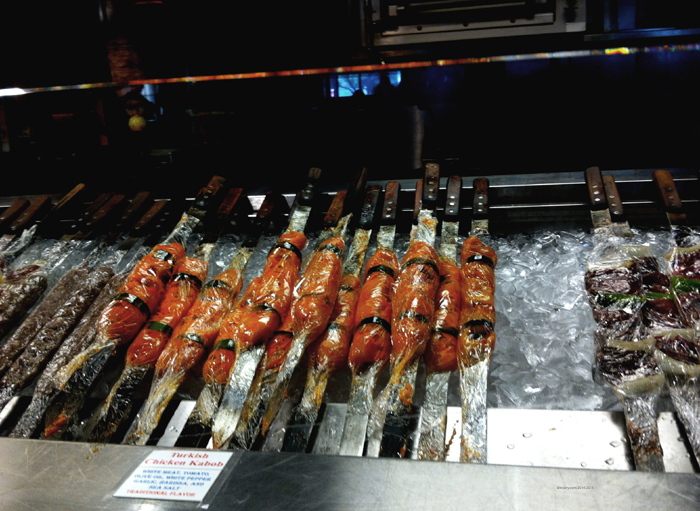 For many years now ever since we frequented a fabulous Turkish restaurant in New Jersey, I have been in search of a place that delivers food with authentic flavors. Consistently. 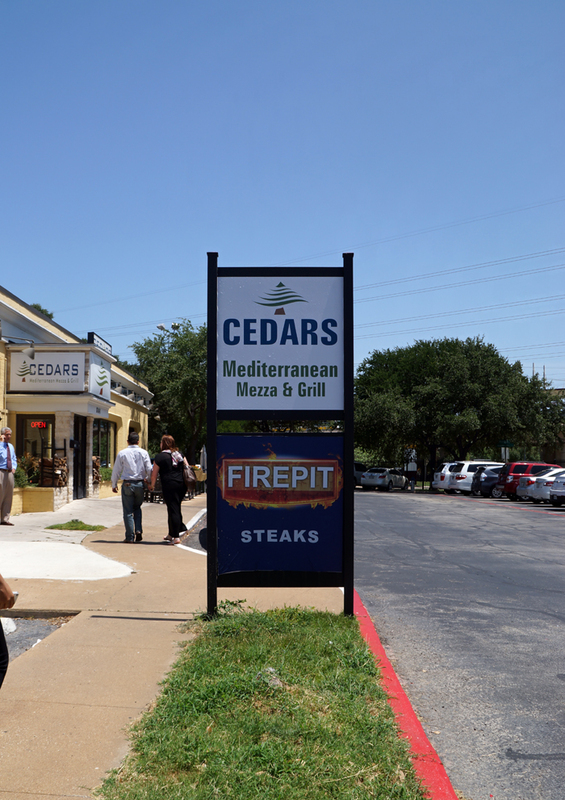 I think Cedars Mediterranean Mezza and Grill satisfies all criteria that I have been looking for. 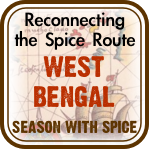 Good fresh food keeping authenticity and the traditions of food intact, pleasant ambience of the restaurant, courteous and friendly customer service and affordable price – all packed in one. 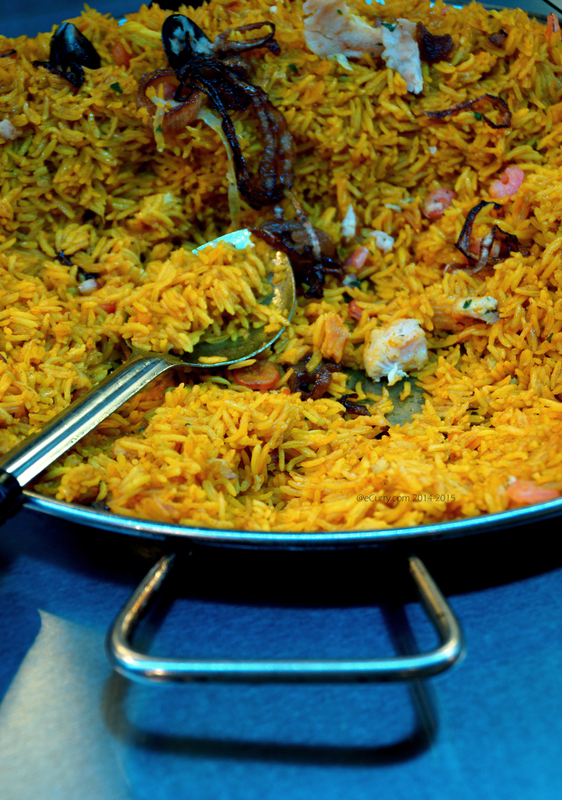 The term “Mediterranean Cuisine” is too general an expression, for the “Mediterranean” region spans over many countries and each country has their own unique cuisine. 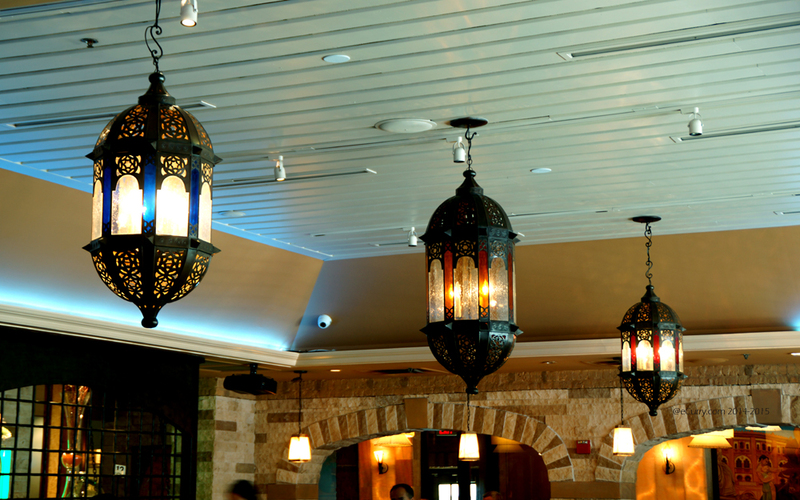 However the enormous spread in this restaurant does complete justice to the flavors of many of the countries in and around the Middle Eastern regions of the world – from popular hummus, tzatzikis and kebabs to seafood Spanish paella, completed by desserts. 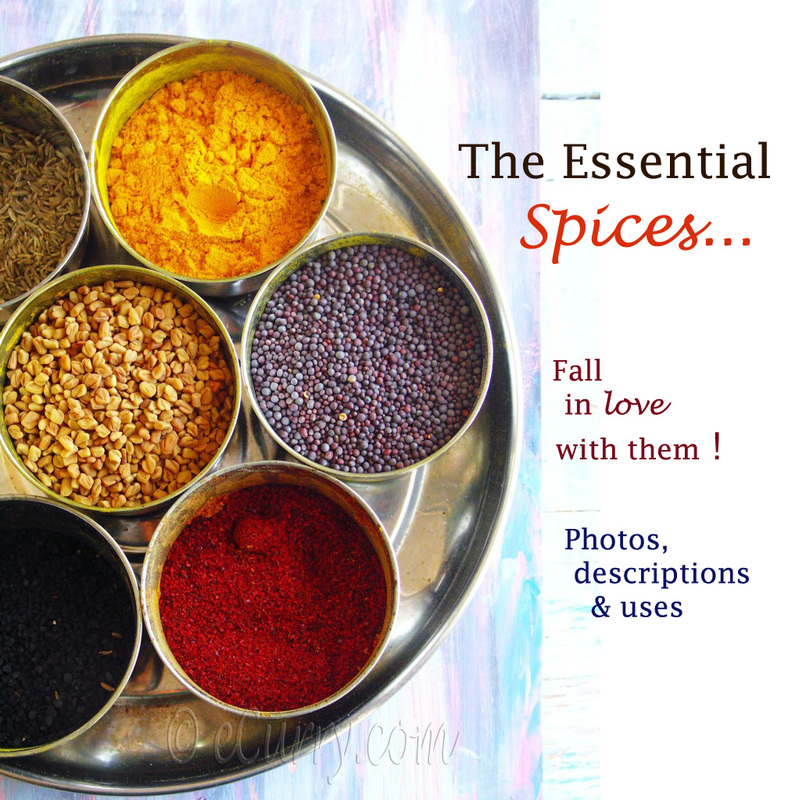 “…recipes have been carefully tailored to bring you the best from dozens of countries of the Mediterranean Regions Spain, Turky, Lebanon, Egypt, Morocco and Greece to name a few. 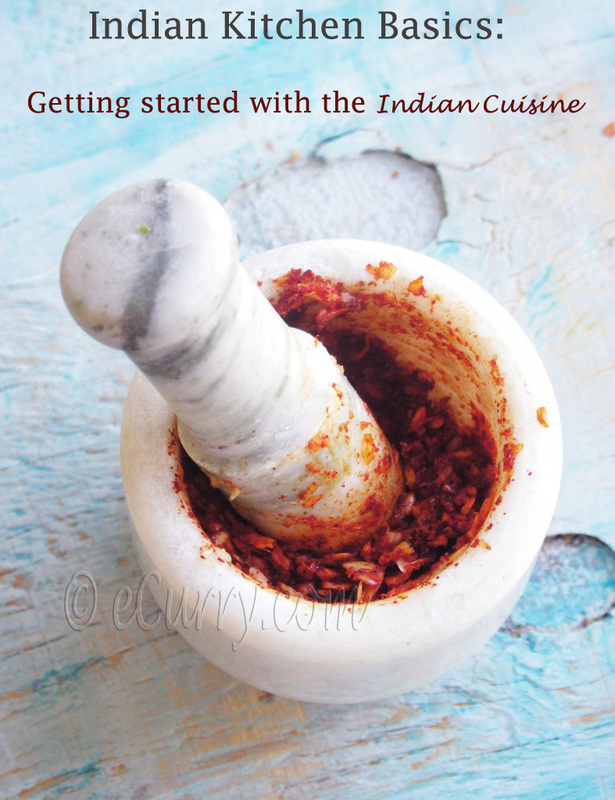 Having a long lasting food tradition and culture…” quoted from the restaurant website. To give you an overview, this is not the regular “to order” from a multi- page menu kind of restaurant. Neither is it exotic or expensive. 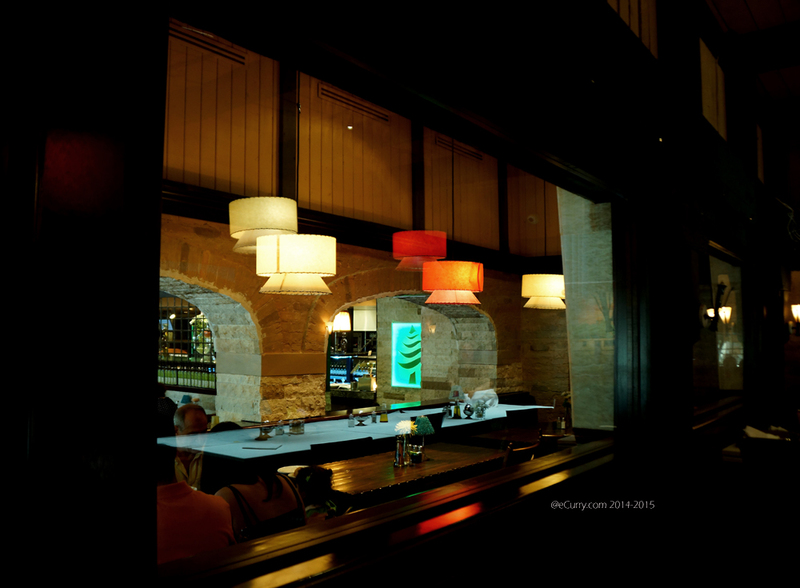 it is informal and casual dining. 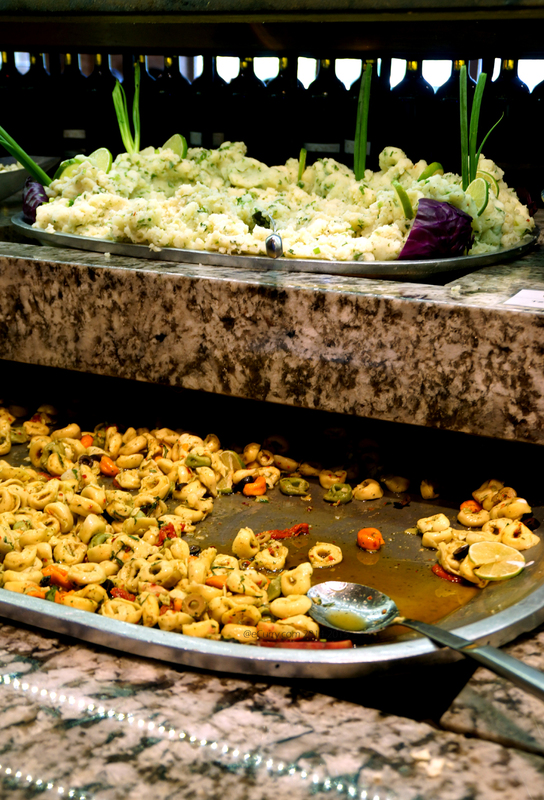 The restaurant is what the name suggests: Mezza or appetizer style spread in the buffet, with some more options to order. However never ever undermine the power of a middle eastern ‘Mezza“. The spread can be enormous and possibly overwhelming. 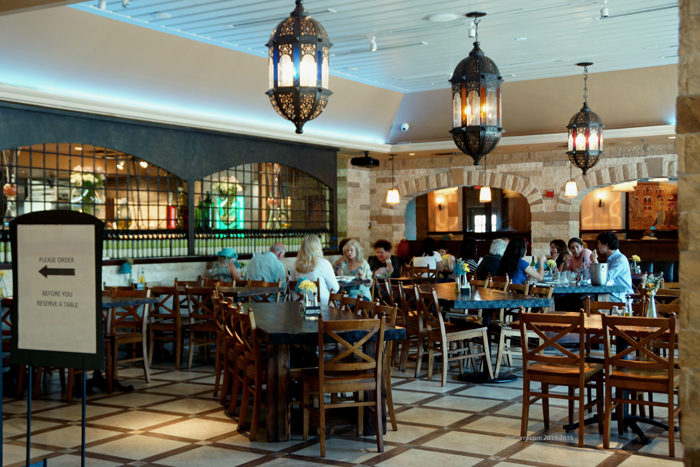 I would like to call this a place where the warm heady flavors of the sunny Mediterranean meet. …but once you walk in through the door, a large archway leads to a pleasantly decorated open space, with tables laid out comfortably. The aura is very pleasurable. 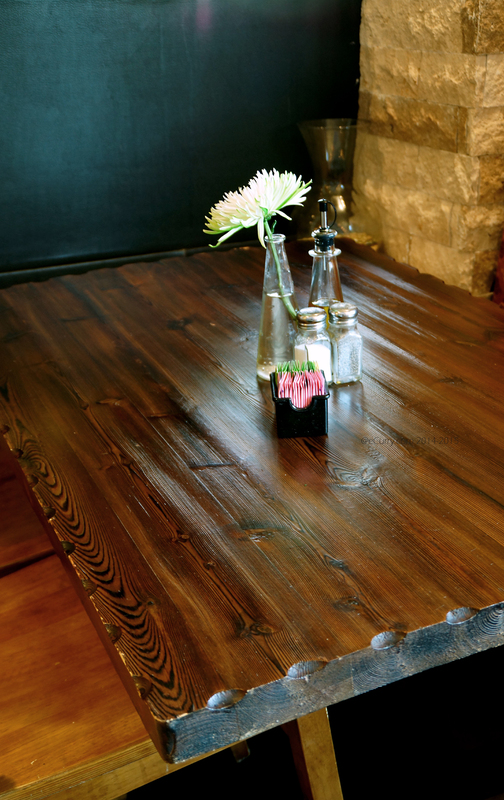 The tables are elegant with gorgeous rich wood, polished in dark stain. Cedar wood? 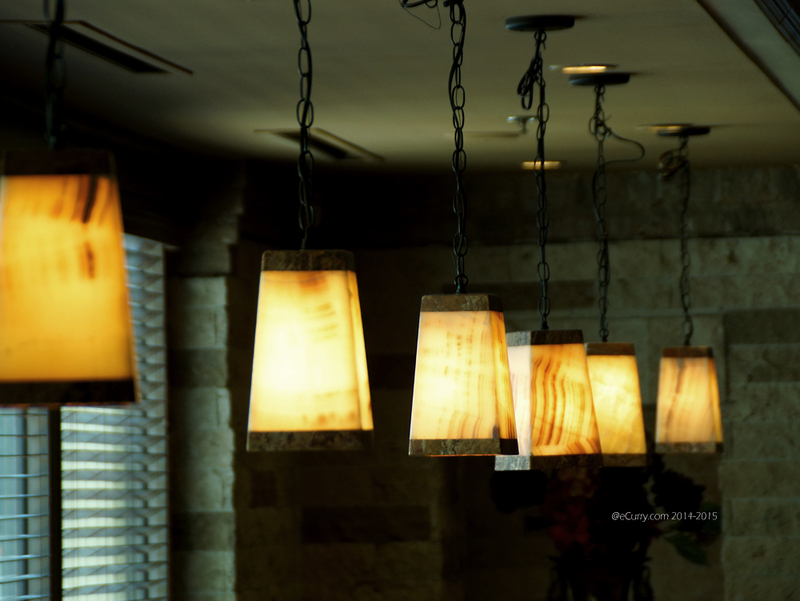 I do not know, but that it what it makes me think everytime I look at them – something I would love to own in my home. Each table is done with fresh flowers. A small touch, but makes a big difference. There are two private and semi private seating areas at the back. A few times we have dined there in a big group, we were seated in the last, largish private come conference area. the semi private area just beyond the main hall. 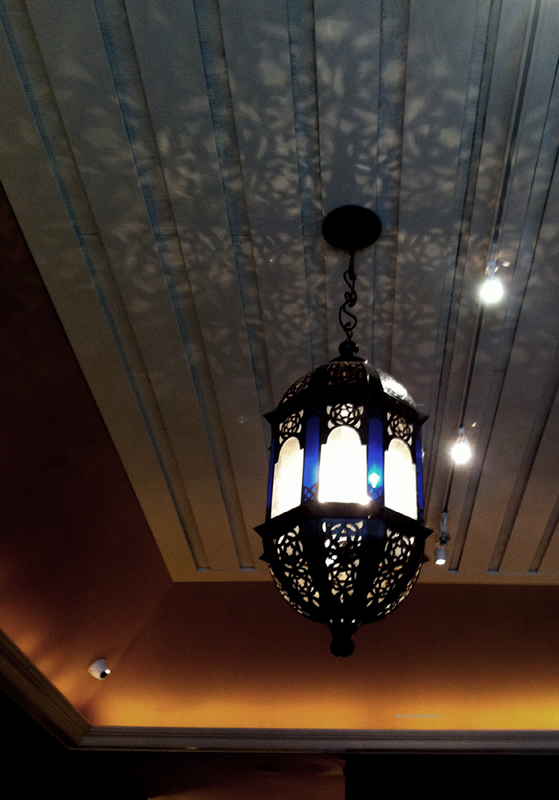 Beautiful lamps, contemporary and Arabic style, light up this space. Not too bright. not subdued – just right enough to set you in a relaxed mood. 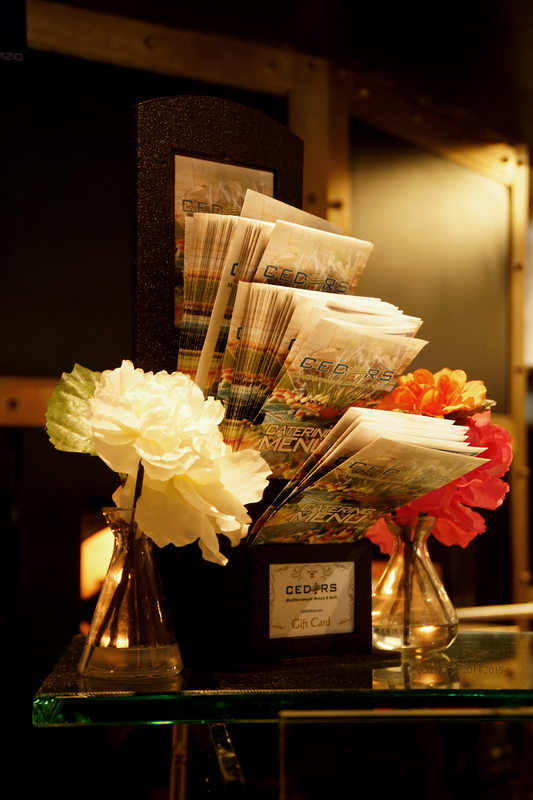 You will be greeted by the prominently lit menu which is up on the wall, as you walk in through the front door. 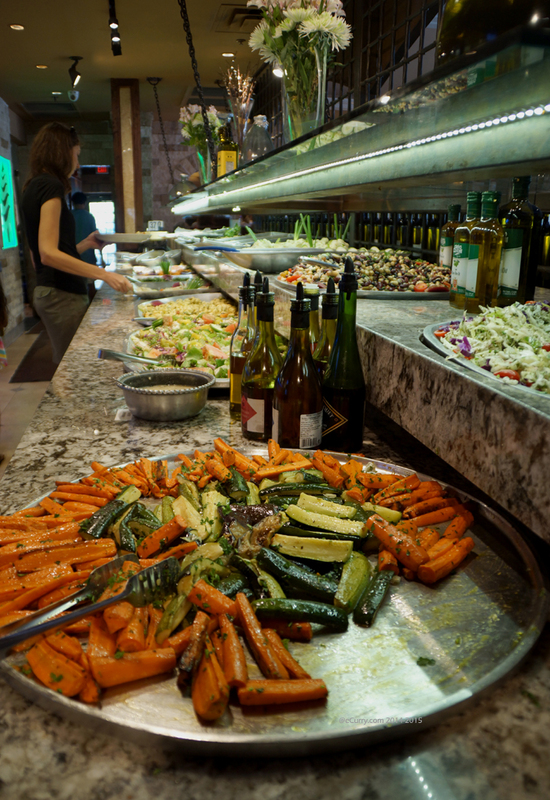 The Unlimited Vegetarian Feast/buffet tops the list which is only $10.99 and has more dishes than you can sample at one meal. 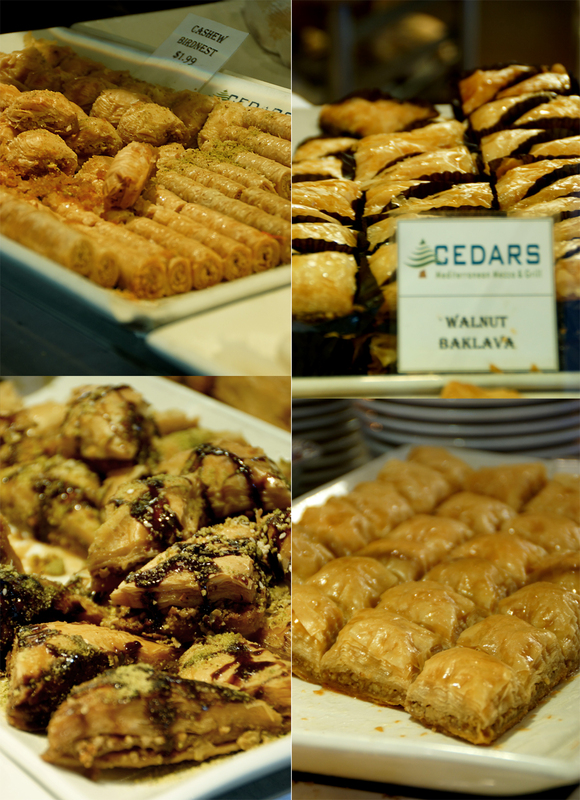 Then there are a few more things you can order; some in combination with the buffet (the Cedars Special), and some just by themselves. 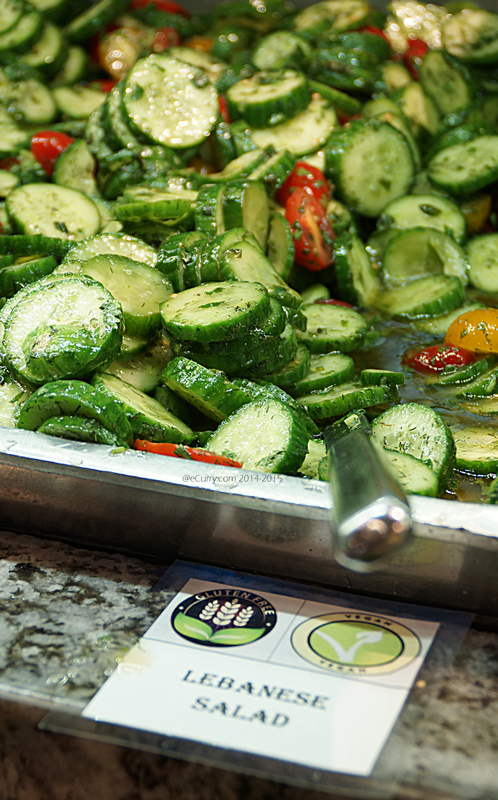 They offer children’s menu at half price for the Vegetarian Feast and also the Cedars Special. The order of dessert is separate. There are quite a few choices which I will list later. After you are done deciding on what you want, you walk through the arch into the main dining area, ready to place your order. They are quick and efficient at the counter. So even if you have walked into an immensely long line, do not fret. It moves fast. 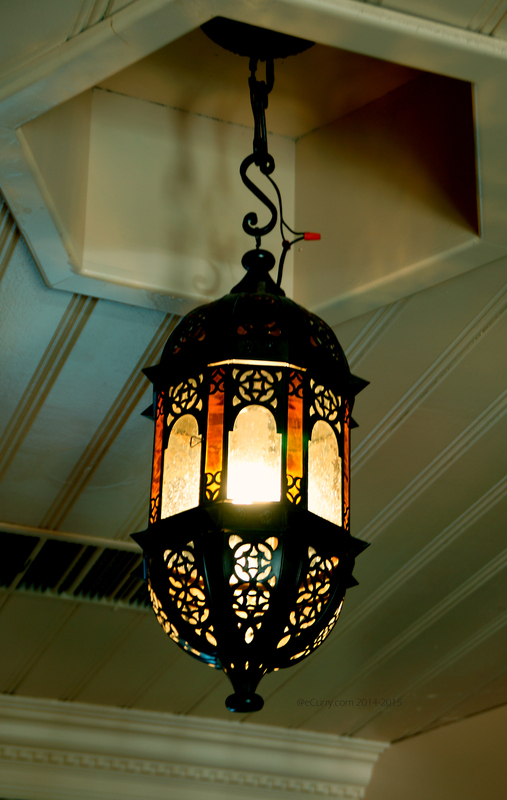 We had been there on one of their busiest days – the after Ramadan ended. Thankfully we had called ahead to reserve a table for 10. (I would recommend calling them ahead to make reservations, especially if your party is big). 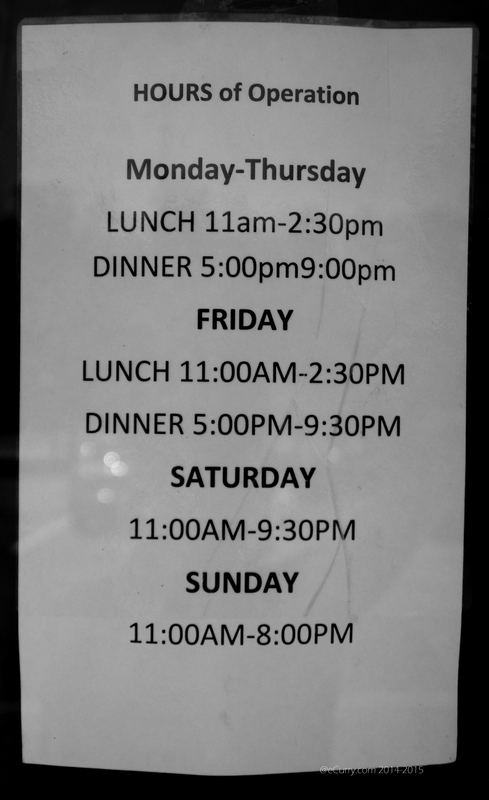 The staff handled the day very efficiently. The line moved fast and the buffet trays were never empty. 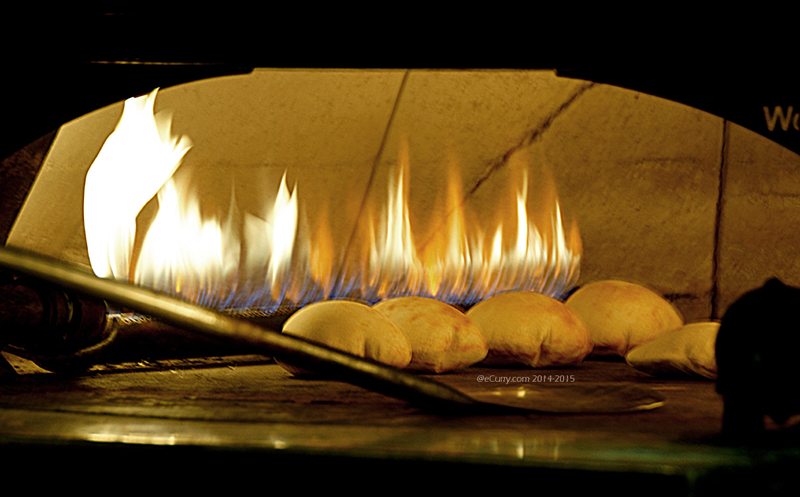 Every time I stand at the pay counter, my attention is drawn at the Wood Stone oven behind… fresh pita gets baked every few minutes. There is that rustic charm and warmth that spreads all over in just watching the bread going in and getting perfectly puffed in open fire. 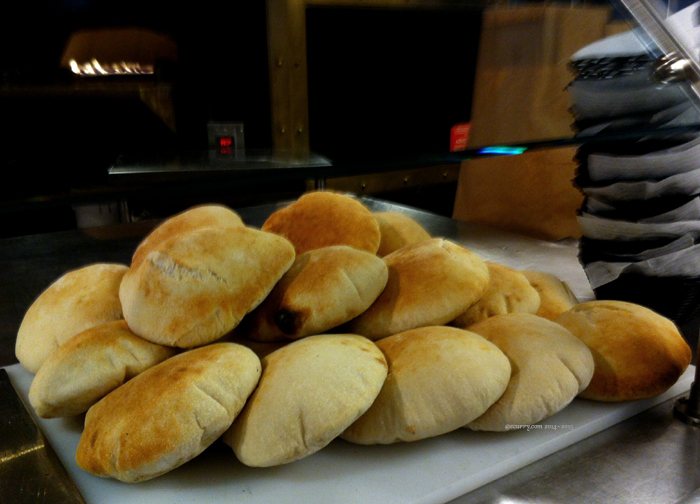 There is nothing more appetizing than the aroma of fresh baked bread. 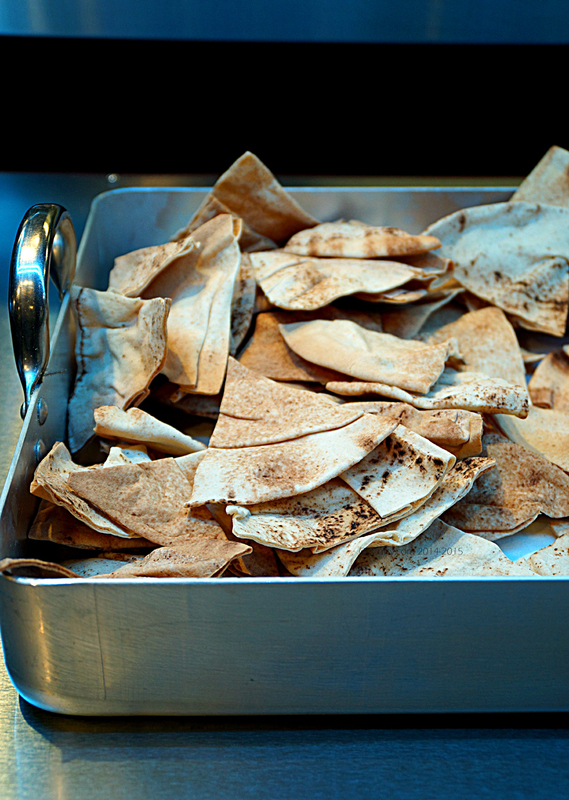 Added to the side are the pita chips; thin and crisp. 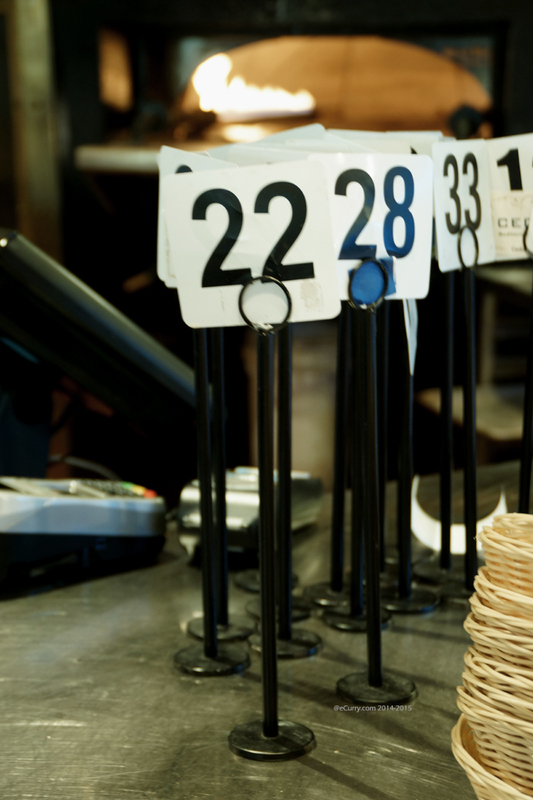 Once you have placed your orders, and picked your number (if you have ordered anything other than the Vegetarian feast, the food is brought to the table) you are ready to start your journey. 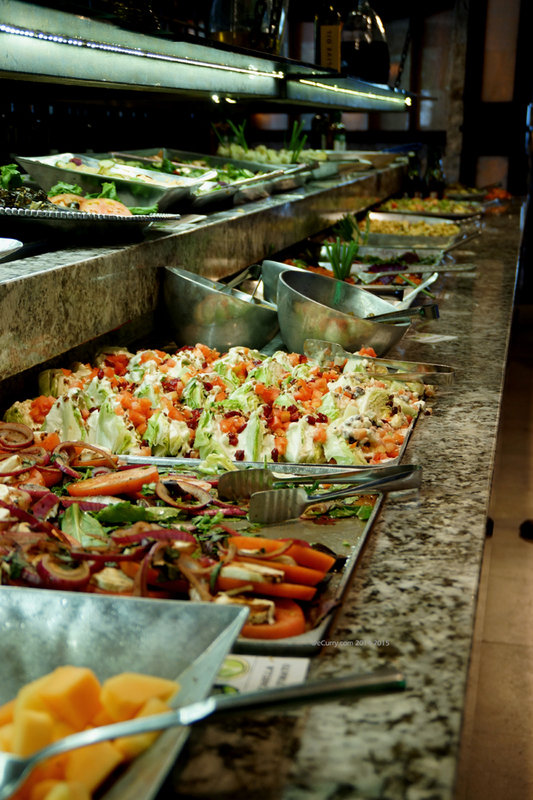 Here are some of the items that are a part of that enormous Unlimited Buffet...Please note that all the dishes are labeled as Vegan and/or Gluten Free. 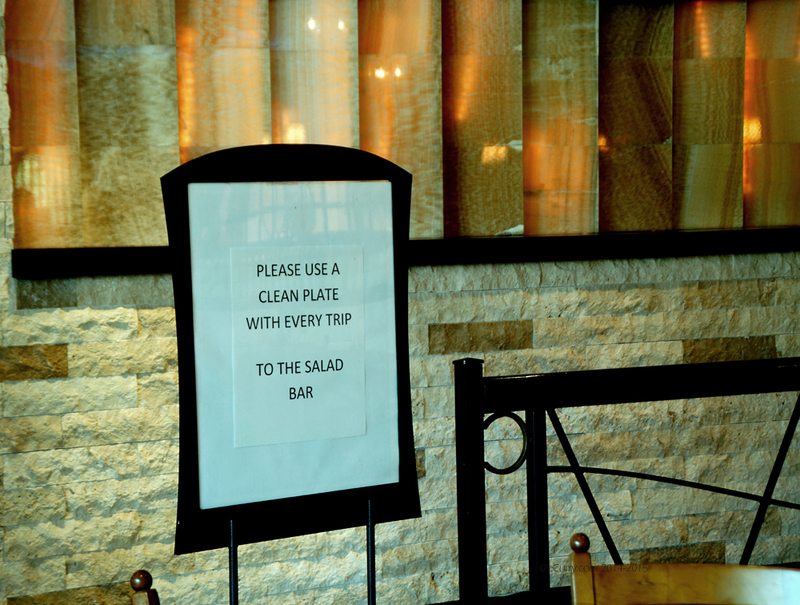 I thought this was a really smart gesture and makes it easier on a lot of customers with dietary restrictions. 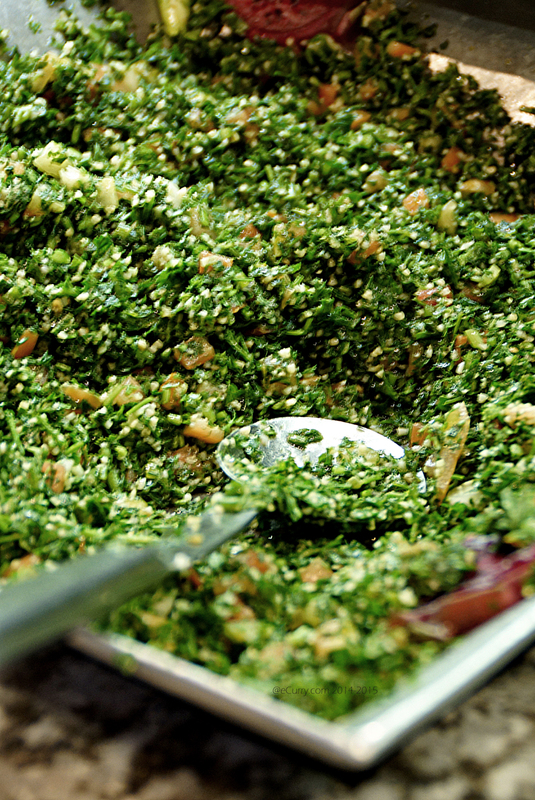 Tabbouleh: the best I have ever had and I think very authentic. 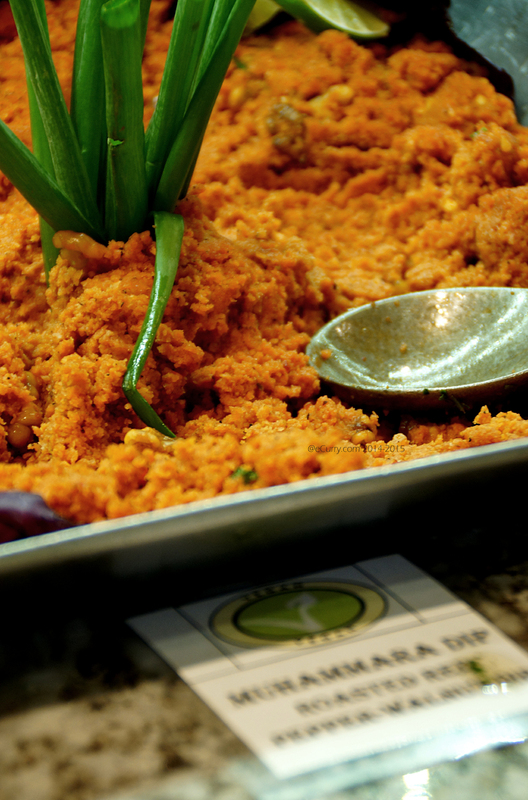 Less grains/bulgar and more green, just the way it is supposed to be. 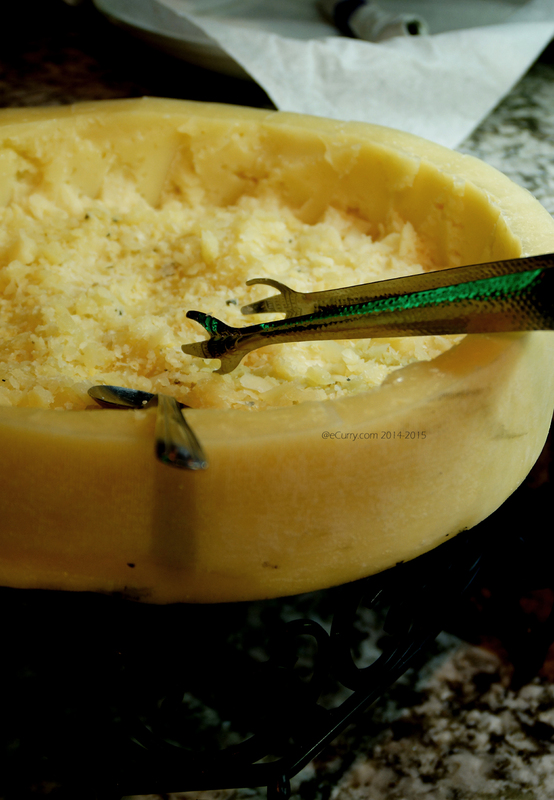 It is fresh and aromatic with plenty of parsley. One time this was too lemony and that is not what I like. I prefer the perfect balance which they usually have and this is what make them different from all the other places I have been to. Lebanese Salad: Cucumber and Tomatoes with herbs and light lemony, olive oil dressing (I think). 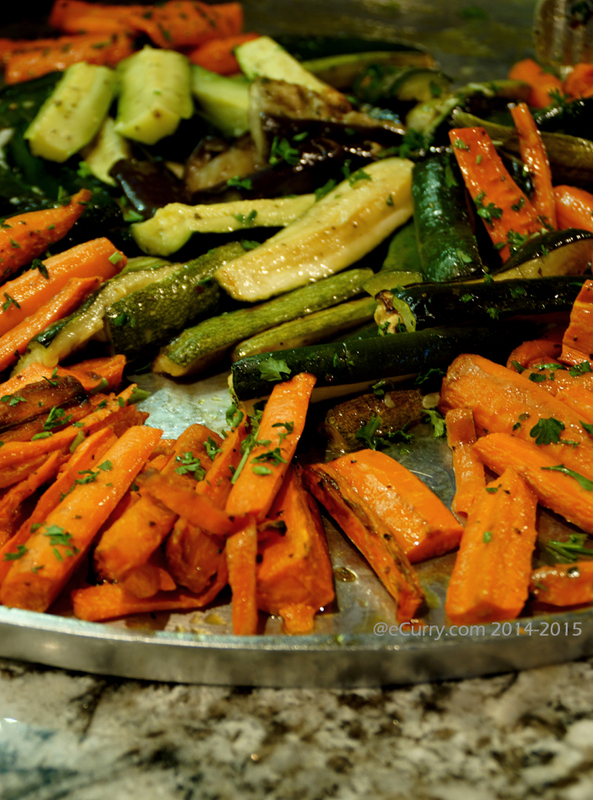 Roasted Vegetables: carrots, eggplants and squash. 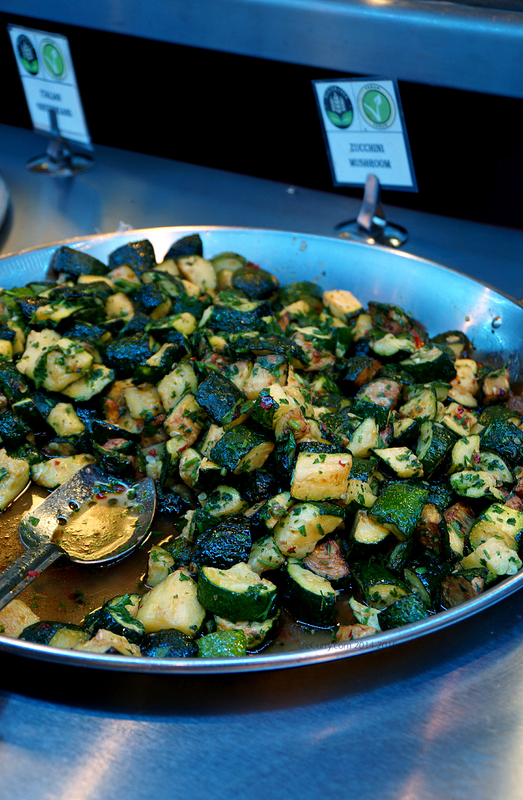 My favorite is the perfectly roasted eggplants. 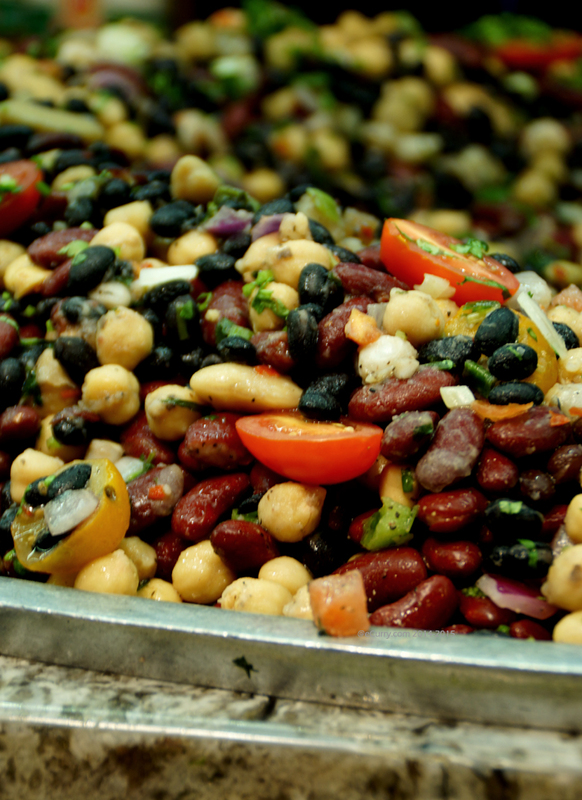 Mixed bean salad. You cannot go wrong with these. Dolmas (sorry for the bad photograph). 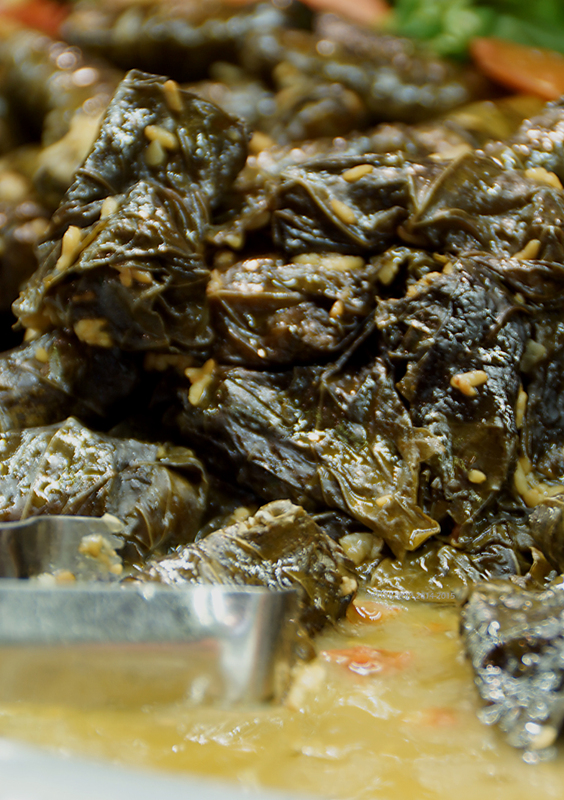 These are the best dolmas I have ever had. 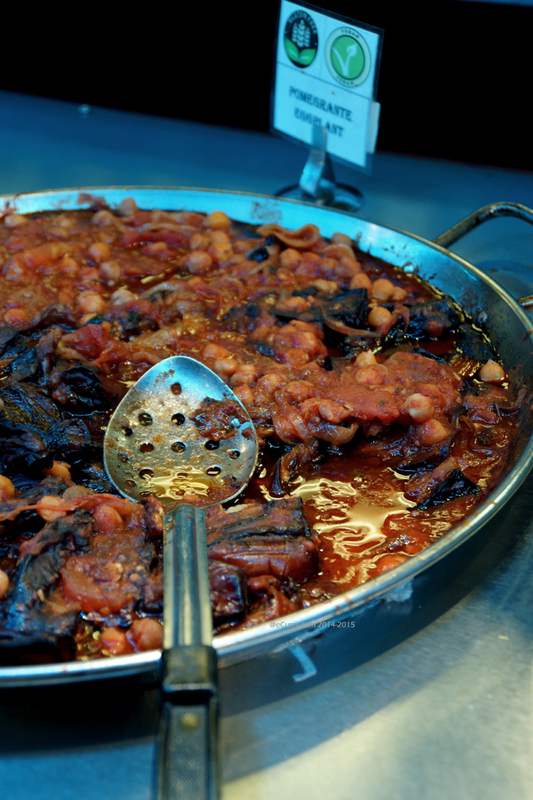 Moist, tender with a prefect bite and the right balance of everything! I was told that they are made fresh in the kitchen. 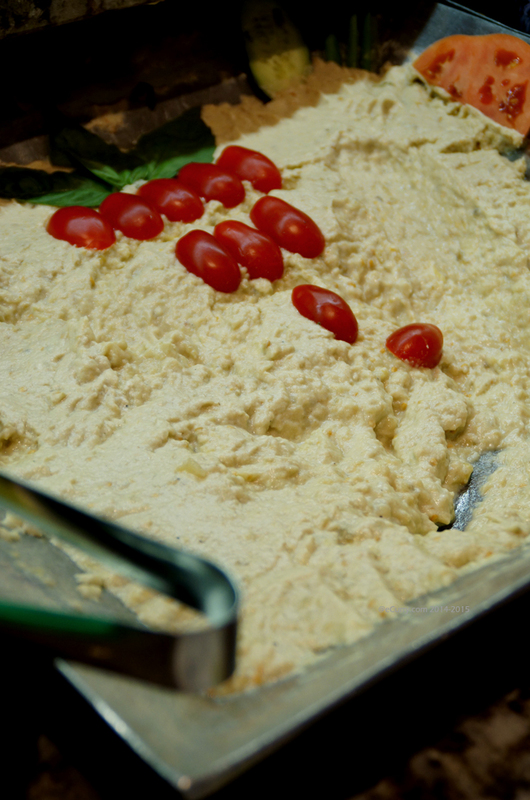 Baba Ghanoush (roasted eggplant dip). I cannot believe I did not take a photo of Hummus! Give me those pitas and hummus and I could make meal out of it. They usually have the regular hummus and another spicy paprika one. 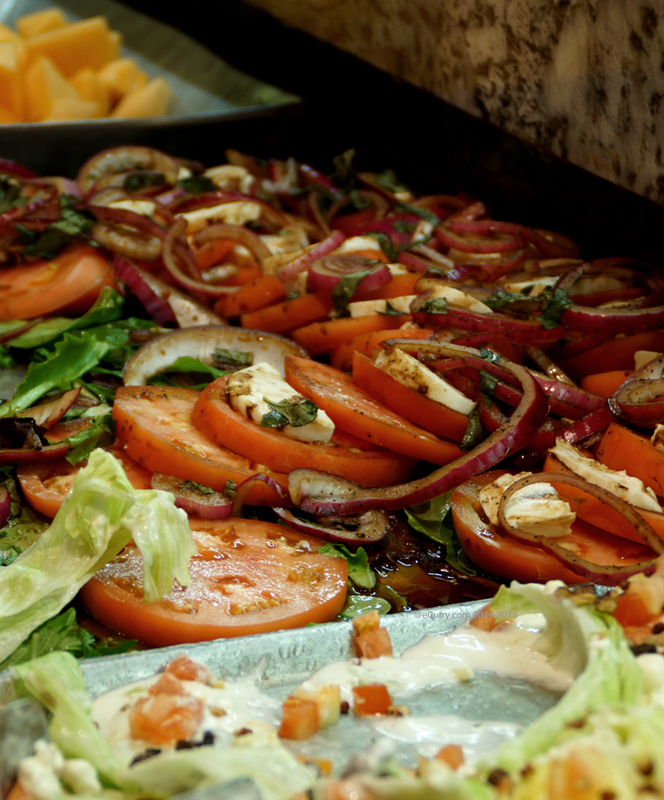 Caprese with Mediterranean flavors: salty and tangy olives and onions add quite a zing to it. I have only covered some of what they offer. 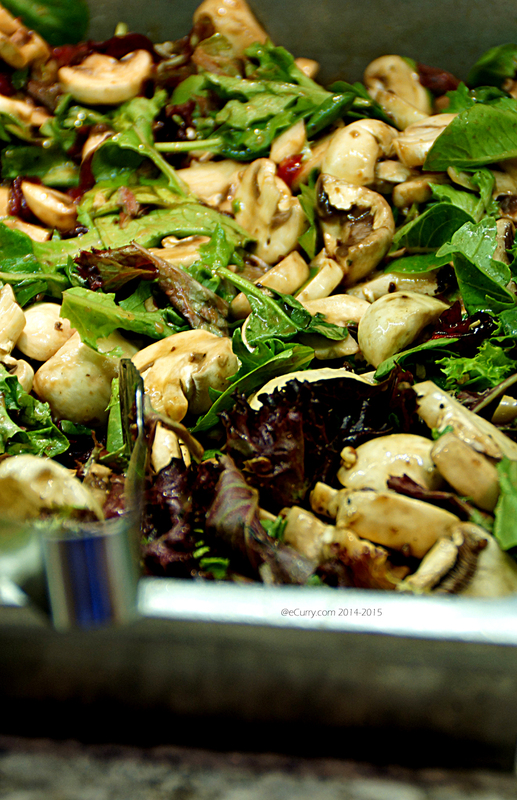 They do have more salad which I have not listed. Some choices vary from day to day. But the above dishes are pretty much always available on all weekends. Besides these they always have a selection of fresh seasonal fruits. 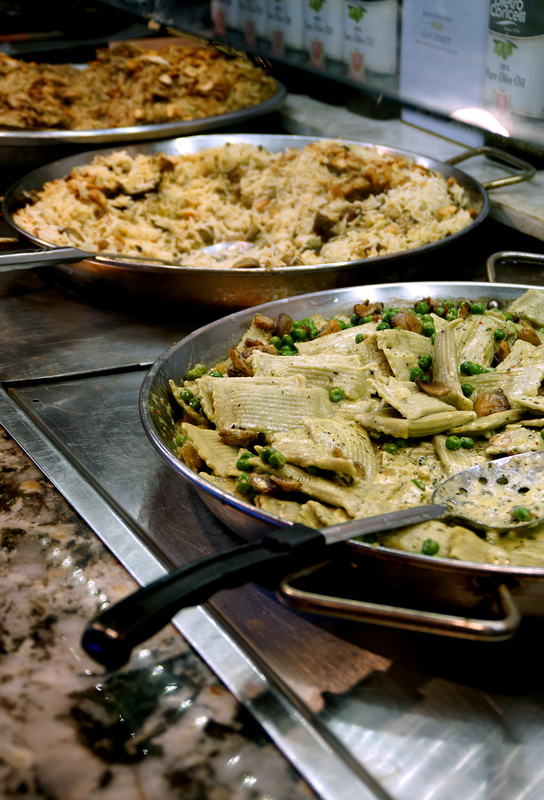 Across the lengthy spread of all vegetarian buffet there are two more areas that serve warm food: soups, pasta, pilafs, paella and then an adajcent area with vegetarian sides. 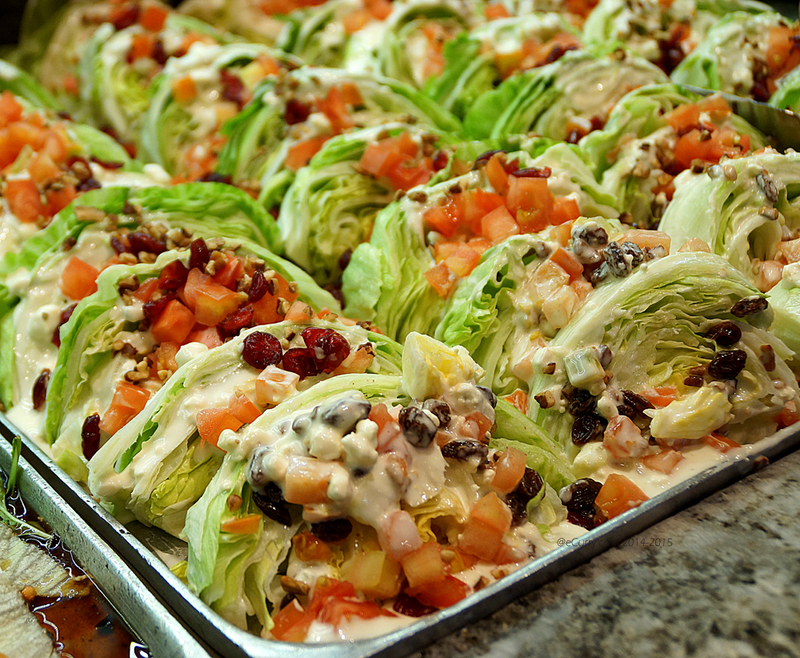 These are a part of the Unlimited Vegetarain Feast/Buffet too. Warm Pasta, followed by a Vegetarian Pilaf with Cashews and then another Pilaf with meat in it. 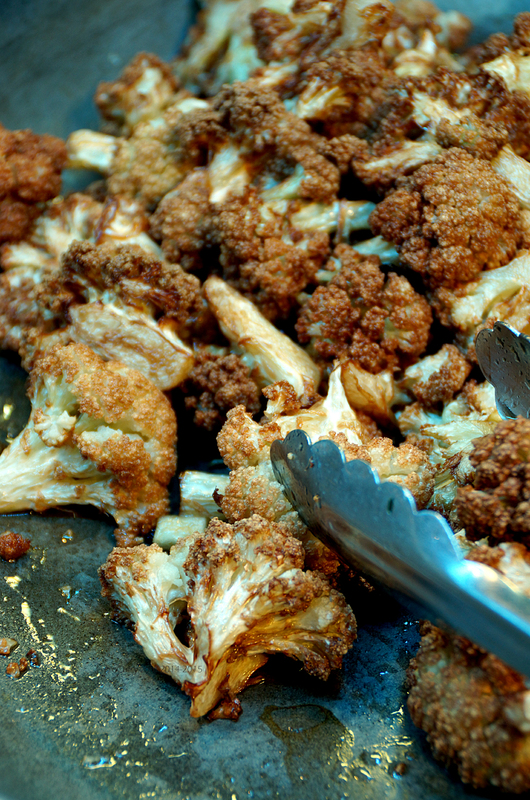 Fried Cauliflowers: this is one of my favorites! 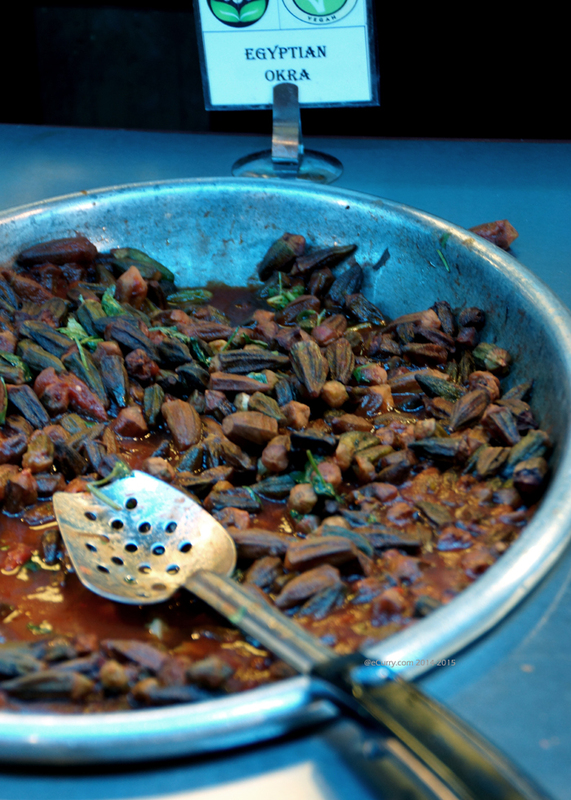 Eggplant in Pomegranate Sauce: This is one of my favorites. 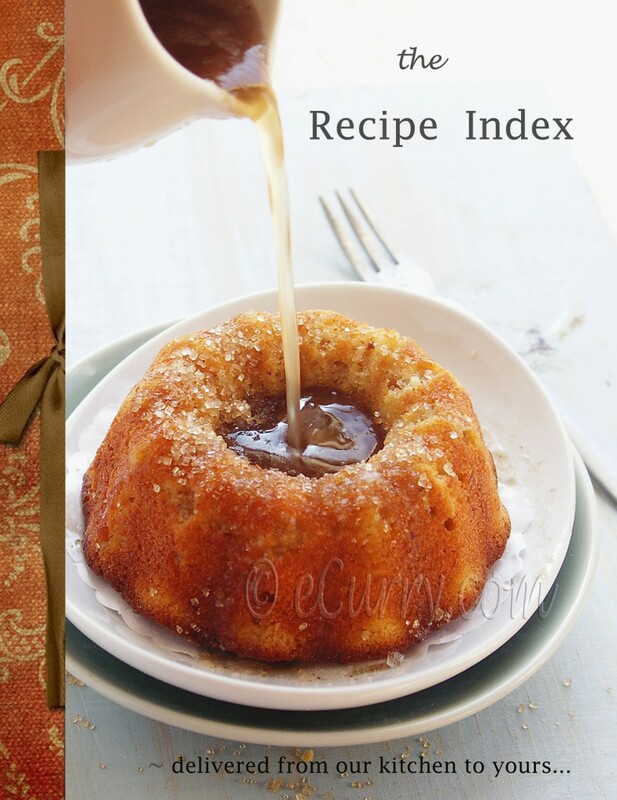 The flavors are so well balance and intense with the use of pomegranate molasses. A definitely not to be missed dish. 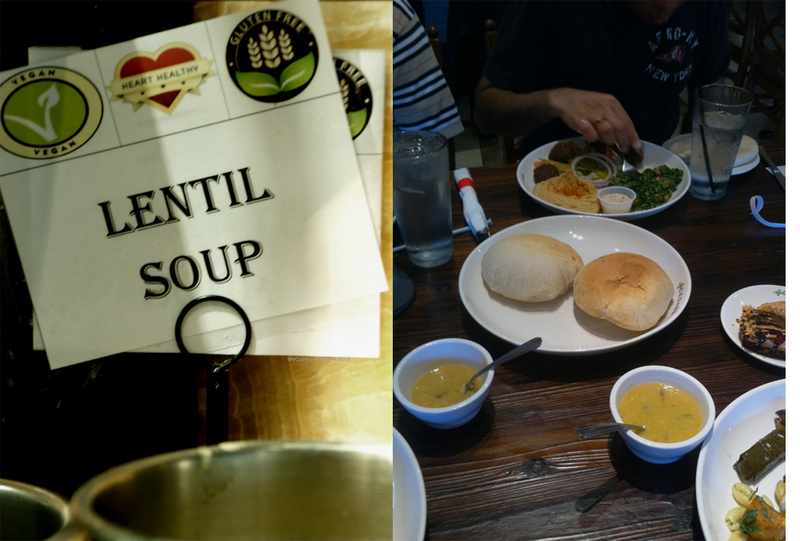 Besides the Unlimited Buffet, we have had a few opportunities to try out the other items from the menu. 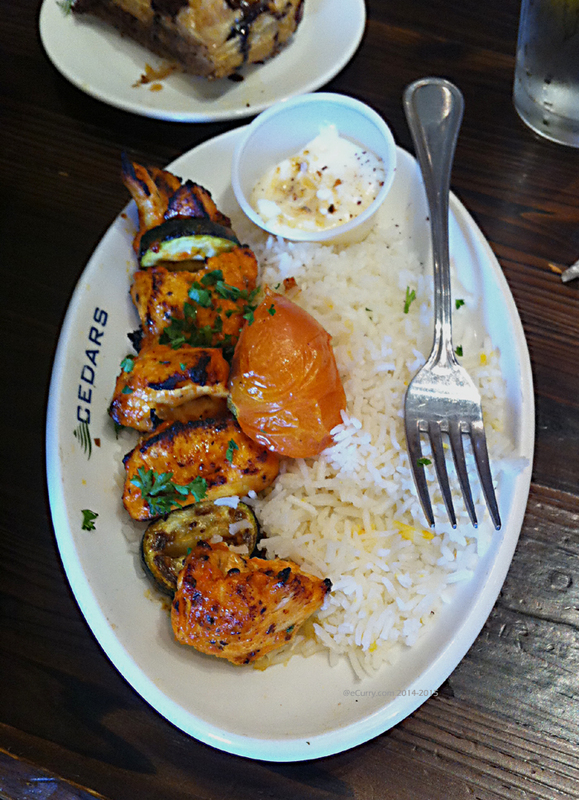 We almost always order the Turkish Chicken Kebab for the Cedar’s Special: succulent bites of grilled chicken is placed on a bed of aromatic rice. The portion is quite big. The only thing I would want to be changed here is the mayonaise that they serve in the small cup. 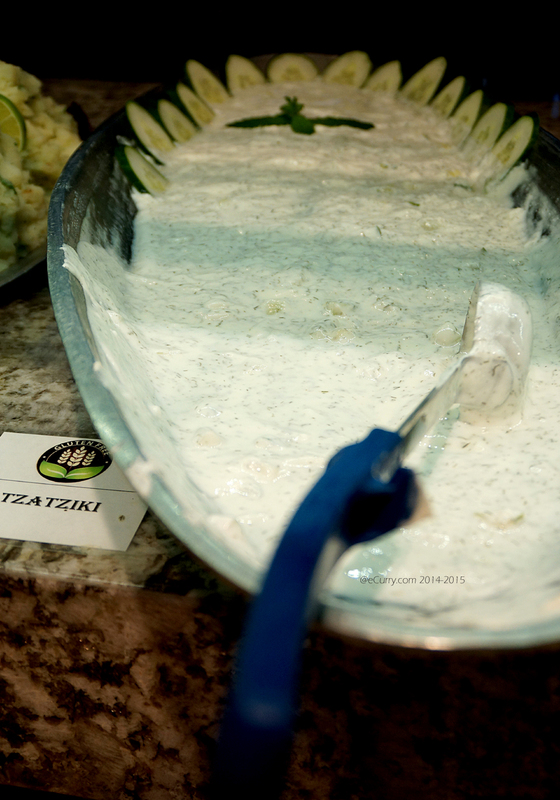 The Tzatziki they have would have been so much better with this! 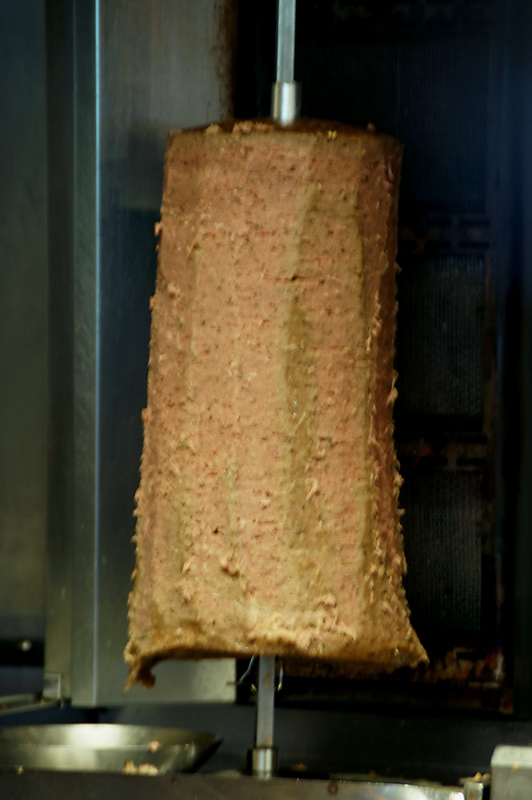 They also have other meat for kebabs and Shwarma which I have not tried. 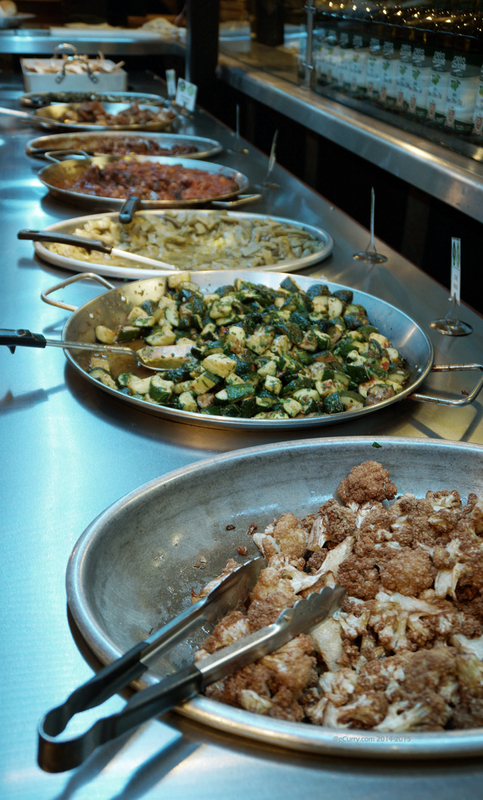 Salmon and Rosemary Chicken are offered too in the non-vegetarian selection. I am not sure if these change but our friends ordered the shwarma, salmon and the rosemary roast chicken and they quite liked it. 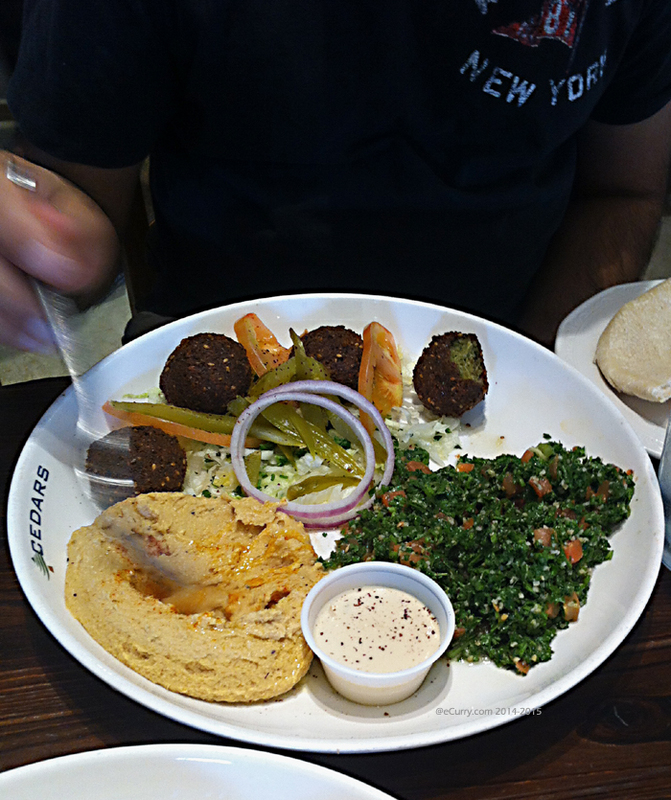 My husband always orders the Falafel platter and it has never failed. 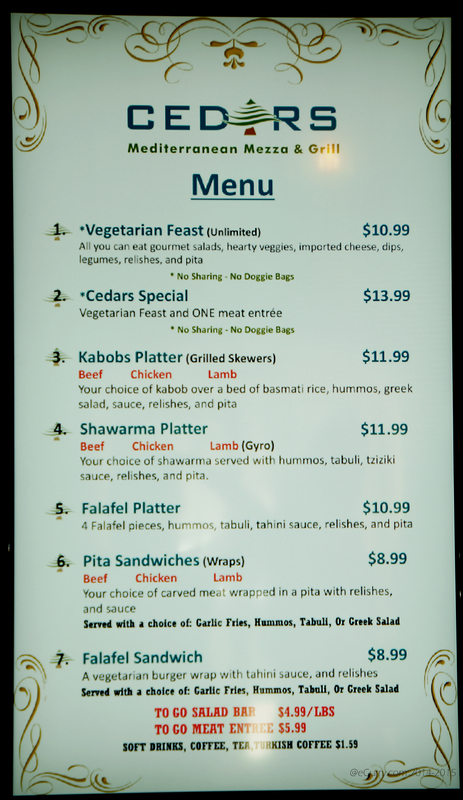 Falafel, a big serving of hummus, tabouli and pita are included along with some other relishes. 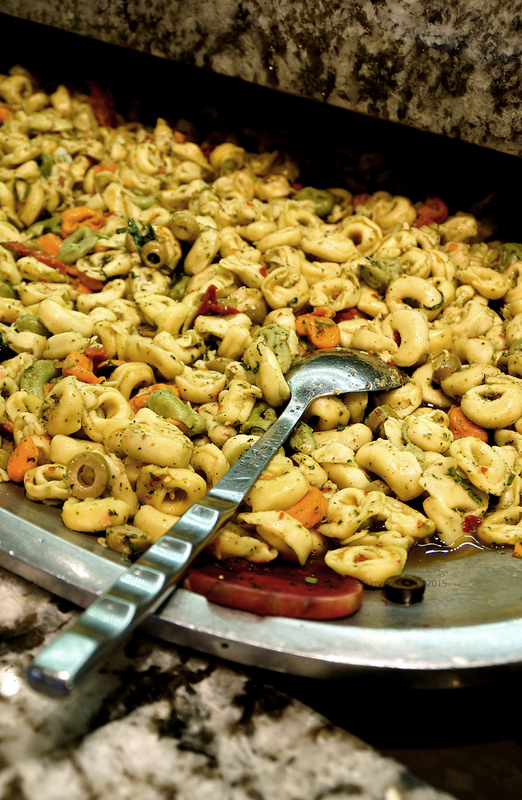 It is a big and filling platter. As I have mentioned before the staff is uber friendly. Every time we have been there, we have been heartily greeted by Muhamad. 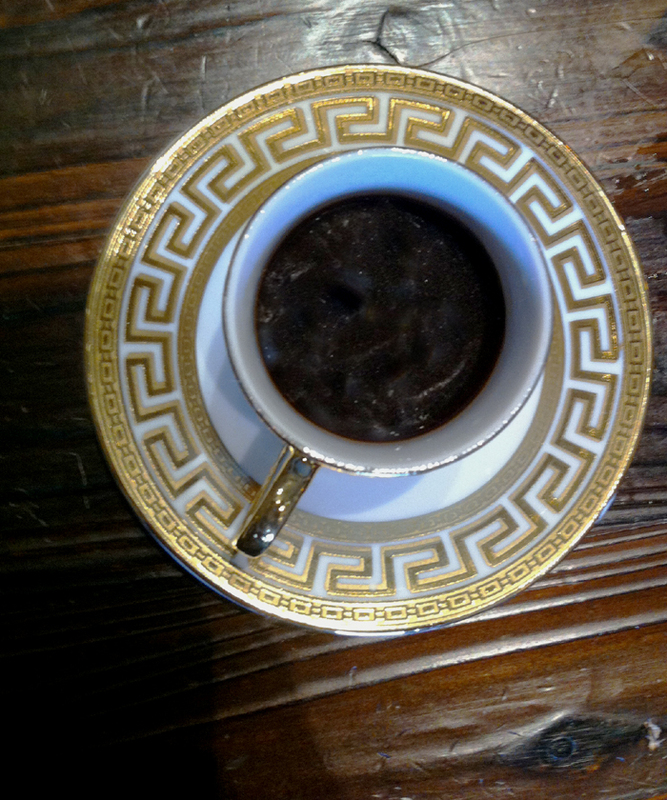 One time when we were dining with a few of our friends, he brought in complimentary Turkish coffee for us. Finally the desserts. 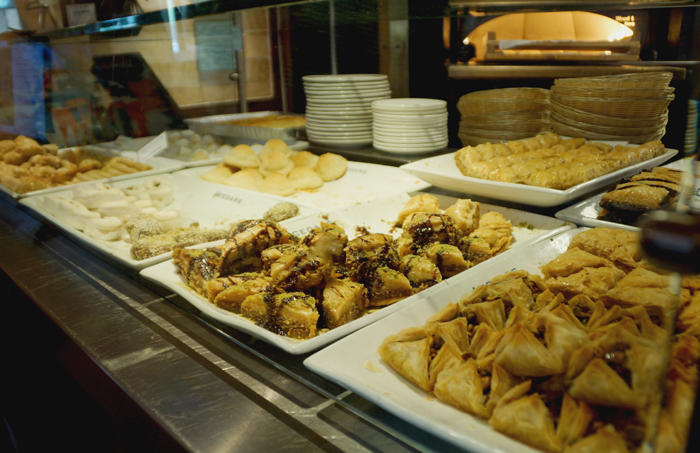 They have the typical Middle Eastern desserts like Baklavas (many kinds with different nut fillings), different varieties of Maamoul cookies and Künefe. 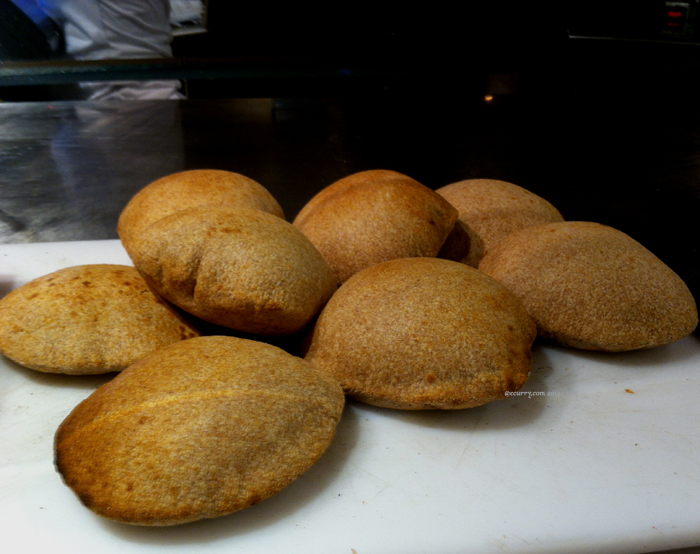 There are other kinds, like the nut Birds Nest – coarsely ground nut enclosed in layers of flaky and buttery phylloh dough. All the desserts pair really well with the strong Turkish coffee! By the way, did I mention that you can BYOB? Overall, we always have had a wonderful experience. 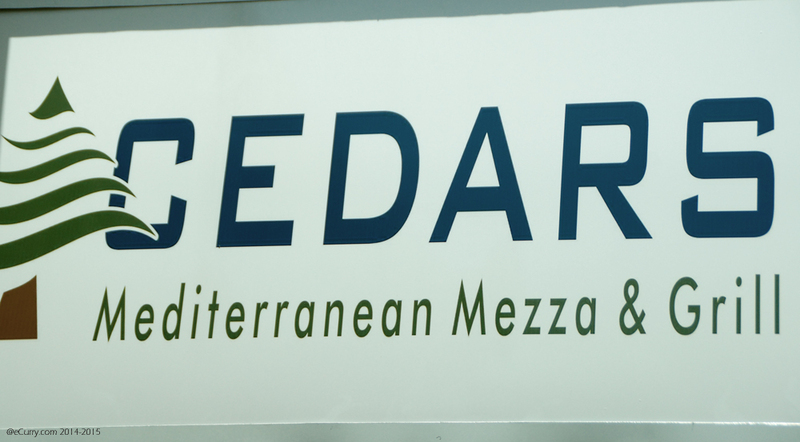 Thanks to the staff and ower, (and other customers) of the Cedars Mediterranean Mezza and Grill for accomodating me when I walked around taking photographs. Thanks for the free coffee and the excellent service and food. 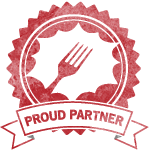 Thanks for delivering authentic flavors and food consistently. Keep it up! This is not a paid or sponsored review. I have done this review for the blog and stated my opinions over multiple visits to the restaurant. 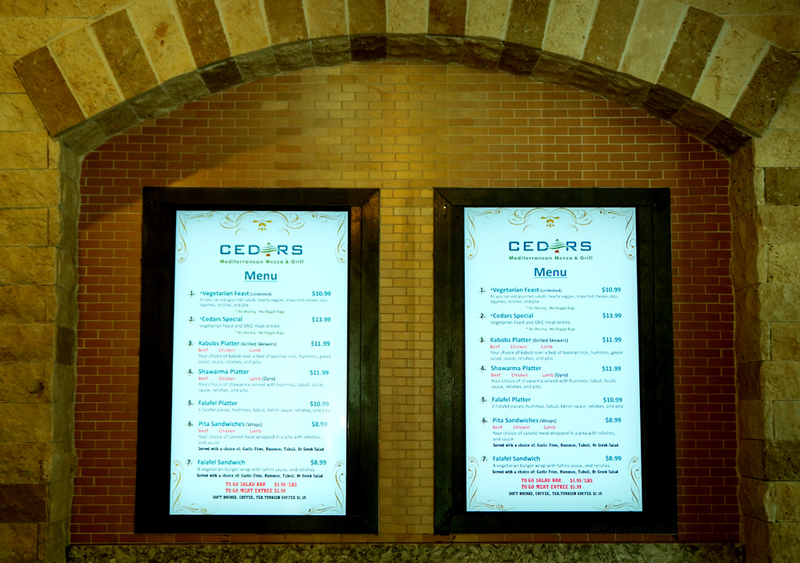 Excellent review and pics of the cedars restaurant. Very reasonably priced as well. I am drooling. Love Turkish food. Your pictures are making me hungry and I just ate lunch. It looks like a great place. Do they have plans to open a branch in Northern Virginia?